As you may or may not have heard, there’s a Gala Fundraiser event that starts on July 9th. 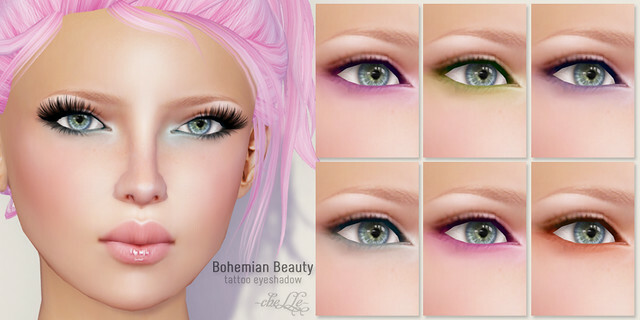 ✿ cheLLe ✿‘s contribution to this event is the Bohemian Beauty set of six under-eyeshadow. I am donating 50% of the proceeds from the sale of this makeup set to Gala Phoenix. Hope you guys enjoy, and see you there! If you want to know more about why this event is being held, I’ve found a thorough blog post with a ton of links about the Gala/Hush situation, compiled by LeeHere Absent. I’m thrilled to see you and all the top designers standing up for Gala and supporting her like this. So sad what happened and to think that it could happen to anyone who works so hard creating original content. Shame on you, Hush Darkrose. You never thought she would (or could) call your bluff and now you have to show your hand. I’m glad and thankful for your participation in this effort to help Gala. Bless her heart! This whole thing is a nightmare come true.I’ve been on SL since 2006 and have worn Gala skins almost exclusively from day one and there is not one iota of truth to these outrageous claims against her. I don’t know Gala Phoenix,but, I do know that we must all band together and help her fight this craven interloper. I am so angry and disgusted I could sh*t lightening and spit nails. I ,and many others have discovered thieves selling both unaltered and slightly altered skins innumerable times throughout the years and my heart goes out to Gala to have to deal with it constantly instead of spending time creating.This sadly applies to many of our talented creators in SL as I’ve seen their works duplicated and sold way under value so many times that I am beginning to wonder why they bother at all. We all know how damn hard these artists work to create fine quality content for us and to show our appreciation we should,no,we MUST all take a firm stand against this blatant content theft by always reporting it and supporting them 100% when they are under attack. I’m happy to help Gala out. I only recently noticed her sim was down (I’m fairly oblivious to the goings-on of the fashion world), and reading through a lot regarding the matter, I’m ready to get out there tomorrow and spend some Lindens to help her out. Big ups to the designers who are helping out and holding the fundraiser. Can we say Naughty? I still miss that business.